All year long, the people of Munich look forward to the Oktoberfest. When the time has come, the city’s inhabitants, joined by tourists from all over the world, put on their Lederhosen and Dirndl dresses and gather on the Wiesn. With seven million litres of beer flowing at record speed, social boundaries are soon overstepped. The grass by the tents is used as urinals and becomes strewn with intoxicated corpses, while the police and medical teams try to keep up with sinking inhibition thresholds. 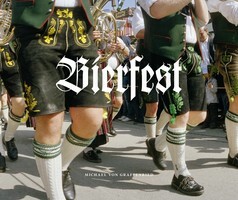 Bierfest shines a light on the decadent side of what is probably the most famous folk festival, and celebrates its nostalgia and mass elirium in equal measure. Michael von Graffenried was born in Bern in 1957 and lives in Paris. He started out as a photojournalist and today works on long-time projects using different media. His photographs were exhibited in France, Switzerland, New York, Algier, Hong Kong and Beirut and are part of various international collections. He was the third Swiss photographer, after Robert Frank and René Burri, to receive the Dr.-Erich-Salomon-Prize of the Deutsche Gesellschaft für Photographie (German Society of Photography). Bürgerkrieg, Flüchtlingskatastrophe, Drogenszene: Michael von Graffenried fotografiert mit einer Amateurkamera, die ihm erlaubt, sich den Menschen unbeobachtet zu nähern. Genau so hat er nun die Besucher der Wiesn fotografiert.